Accurate Leak & Line is an established plumbing rehabilitation company utilizing non-destructive trenchless techniques. Our group of master plumbers provides expert diagnostics and cost effective repair solutions for sewer and water piping systems through epoxy pipelining and traditional excavation and repair. 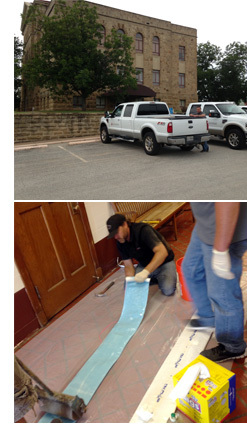 Our services are offered to residential and commercial clients throughout Texas, including Dallas, Ft. Worth, Tyler, Austin and San Antonio, and surrounding states.With our extensive background in slab leak detection in Austin, and years of experience in non-destructive trenchless plumbing repair, we have combined re-piping and replacement alternatives with conventional repair methods to create an environmentally safe and sound plumbing infrastructure rehabilitation process. In addition to residential properties, we utilize this unique process to deliver safe and sanitary water to and from schools, municipalities, businesses and communities alike. Along with trenchless plumbing restoration, water leak and drain leak services in Austin, we provide sewer line video camera inspection and plumbing testing for foundation repair evaluation. Detailed analysis and fixed cost proposals for repair are provided to customer upon completion of diagnostic slab leak testing, using trenchless plumbing technology to fix foundation leaks while minimizing digging and added expense. Continual sewer stoppages were plaguing the women’s public bathroom located in the dead center of the courthouse. The main sewer line for the bathroom was video camera inspected and it was determined that a large section of the bottom of the pipe had deteriorated and was catching toilet paper and causing sewer back-ups into the women’s restroom. Accurate Leak and Line installed new clean-out access for insertion of approximately 40 feet of 6 Inch diameter Cast In Place Epoxy Pipe-Liner. The Liner was installed on the weekend in 1 day while the courthouse was closed with no interruption of business. Thousands was saved in excavation costs and the historical value of the building structure was preserved. 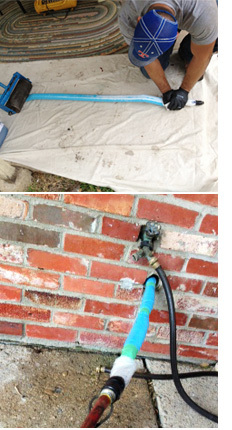 Accurate Leak and Line specializes in Epoxy Pipe Restoration of failing building pipe systems. Our 14 years of specialized experience along with an impressive portfolio of high profile and sensitive jobs sets Accurate Leak and Line apart. Accurate Leak and Line technicians were referred by one of their many clientele within the realty industry to diagnose sub slab plumbing leaks in the sewer drain and water pipe systems. The realtors’ client was in the option period and concerned with the aged plumbing pipes located below slab and throughout the homes walls and ceilings. Homes built prior to 1980-1990 contain failing deteriorated cast iron sewer pipes below slab and rusty galvanized incoming supply water pipes in the walls and ceilings. These failing systems can be detrimental to a homes’ structural integrity causing foundation issues and flooding within the home and serious damage when gone unchecked. Accurate Leak and Line uses Hydrostatic Testing and Video Camera Inspection non-invasively detect any leaks and evaluate the integrity of the homes piping systems. Once the leaks are diagnosed, A formal report and fixed cost effective repair proposal is provided. Accurate Leak and Line utilizes non-destructive methods of access and repair to minimize destruction to the home. The deteriorated cast iron drain pipes for the home were excavated from access outside of the home and a tunnel excavation below the slab to replace the drain system with new PVC piping. All work was done from outside eliminating the need to excavate through the concrete slab. Long runs of the house piping system were epoxy pipe lined completely eliminating excavation and saving thousands in excavation costs. The water pipe system in the walls and ceiling were re-piped with a new non-metallic piping system through the attic and fed non-invasively down through the walls from the attic eliminating or minimizing destruction to the drywall etc. The home buyer was able to negotiate these repairs with the seller, and once the deal was final, Accurate Leak and Line renewed all of the piping system within 7 days. Accurate Leak and Line has a vast clientele built on customer satisfaction and great reviews. We are experts in Non-Invasive Leak Detection and Repair, providing 14 years specializing in sub-slab and concealed piping system replacement and renewal. Accurate Leak and Line performs sub-slab leak testing in Austin TX and detection for a large clientele of foundation repair companies throughout all of our Texas markets. A home in Austin, TX recently had piers installed in order to level the foundation. Accurate Leak was contracted via referral from the foundation company, to test and evaluate the sub-slab piping system. Most foundation companies will not be able to warranty the foundation repair work if leaks exist below the slab, therefore, any leaks that do exist should be isolated and repaired in order for the homeowner to protect their investment. Accurate Leak determined from static pressure testing and video camera inspection that the house cast iron sewer system was deteriorated and leaking throughout. Accurate Leak has a specialized tunnel excavation crew that tunneled beneath the slab of the house and traditionally replaces the sewer pipe wyes, tees, traps etc. located below the house bathrooms and installed epoxy pipe liner throughout the house main sewer lines to eliminate excessive excavation. The system was final tested upon completion and a final No Leak report was provided to the home-owner and the foundation company for warranty purposes. Accurate Leak’s expert technicians provide elite testing capabilities and unmatched repair options to a vast clientele within the foundation, inspection, realty and property management industries. Please view our website to learn more about us, or give us a call to schedule a consultation!